A beautiful day in Grand Park. Photo credit: Brian Champlin / We Like L.A.
You know what’s handy? Waking up in the morning, firing up your phone/computer and being able to scan a super quick (but curated) rundown of the best of what lies ahead. 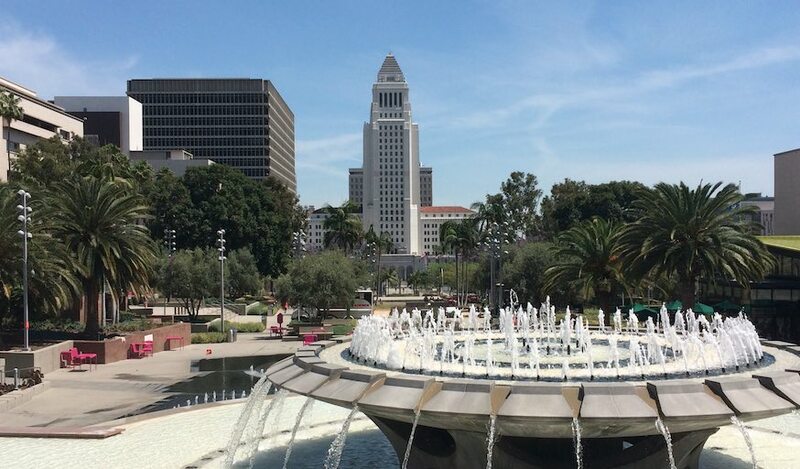 So here it is, our list of fun things to do in Los Angeles for today, Sunday, April 14, 2019. 1. [7 a.m.] From April 12-14 The Toyota Grand Prix features live street racing, live music concerts, a lifestyle expo, kids kart racing, dancing contests, food trucks and more. 2. [10 a.m.] The Original Renaissance Pleasure Faire returns April 6 through May 19 (Saturday and Sundays) at the Santa Fe Dam Recreation Area in Irwindale for another year of fantasy and fun. Children 12 and wunder will be admitted for free on April 13 and 14. 3. [10 a.m.] The largest book festival in the world, the L.A. Times Festival of Books, returns April 13-14 with over 500 authors, celebrities, chefs, musicians, and artists. Among the literary stars and celebrities scheduled to appear: Ali Abbas, Robin Abcarian, Hanif Abdurraqib, Stephanie Abraham, Elizabeth Acevedo, Kwame Alexander, and many more. 5. [10 a.m.] Rancho Santa Ana Botanic Garden located in Claremont welcomes Wildflower Week April 13 through April 21. The nine-day celebration of California’s wildflowers will feature annual displays of California poppies, baby-blue eyes, lupines and much more. In addition, there will be an art exhibition, cocktail parties, guided tram tours and more. 6. [10:30 a.m.] Japan Family Day comes to Santa Anita Park on April 14 for a day-long celebration of Japanese culture, food, entertainment, and fun for the whole family. 7. [11 a.m.] LA Art Book Fair takes over The Geffen Contemporary at MOCA April 11-14 providing artists a platform to display their books, art catalogs, zines, and more. The event is free and open to the public from April 12-14. Opening night takes place on April 11 where tickets cost $20 and comes with a limited edition work by artist Jeffrey Cheung of Unity Press and a special musical performance. 8. [11 a.m.] MONSTERPALOOZA 2019 returns to the Pasadena Convention Center April 12 – 14 to celebrate the art of monsters and movie magic. Over this three-day affair, attendees have the opportunity to meet the award-winning creature creators from feature films, television and the haunt industry, plus loads of panels, presentations, tutorials and exhibits to browse. 9. [2 p.m.] Gelateria Uli located in the historic Spring Arcade in Downtown Los Angeles will host a 5th Anniversary Party from 2-5 p.m. Music, bubbly, tours of the gelato kitchen, and tons gelato and sorbet will be scooped. Everything will be priced at $5, this includes pints, affogatos, and double scoops. 10. [2:30 p.m.] San Gabriel Mission Playhouse welcomes back the Silent Sundays series with live Wurlitzer organ accompaniment. Alfred Hitchcock’s 1929 thriller Blackmail will be screened.